“Washington Realism” bills itself, accurately, as an exhibit in which the artists ignore the “glitz and glam” of Washington’s political culture. One could also say that, to a large extent, it ignores Washington, D.C., itself. The 10 artists included in the exhibit were all D.C.-based, but you wouldn’t necessarily know that from the work on display. The late Manon Cleary, for instance, opens the show with tender portrayals of cloud-streaked skies—-the subject matter of Alfred Stieglitz rendered in the beiges and blues of Georgia O’Keeffe. 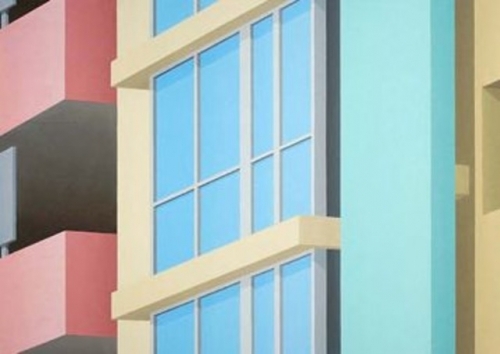 Fred Folsom offers a dainty, bucolic landscape that couldn’t contrast more starkly with the city's streets, while Joe White offers a glimpse of windowed facades rendered in pastel pinks, yellows and greens that suggest Miami. Three artists stand out. Trevor Young returns to subject matter he’s visited successfully in the past—-an empty parking-attendant booth at night, and a jet plane parked amid the broad, negative space of an airport tarmac. Gregory Thielker paints rural road landscapes, most intriguingly a view at dusk from the windshield of a moving car, in which the distortion at the edges is pitch-perfect. And Martin Kotler produces a wonderful pair of Ashcan School-worthy portrayals of train yards, crowned by intricately reproduced jumbles of overhead power lines.